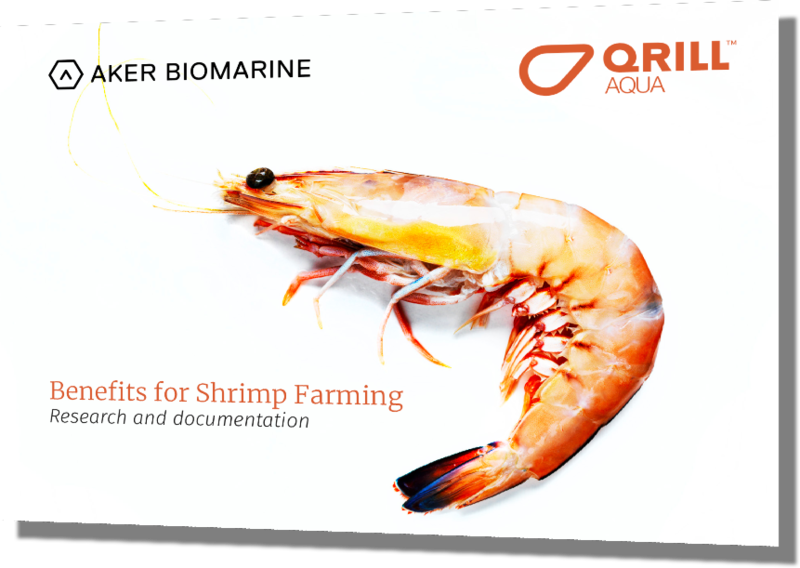 Continued growth of shrimp farming and a change from low-intensity, small-scale to high-intensity, commercial farming has increased the need for sustainable protein and cost-effective sources in shrimp feeds. Krill is a sustainable and natural protein source. It is a functional ingredient with different nutrients highly beneficial for shrimp. In addition, shrimp like the taste of krill. This makes krill a very interesting ingredient. In this article we offer 7 specific reasons why to include krill in your shrimp feed. Inclusion of krill in shrimp feed tends to increase feed intake. Krill consist of different feeding stimulants such as nucleotides, water soluble amino acids and TMAO (Trimethylamine N-oxide). This increases both the attractability and palatability of the feed, making the shrimp eat more pellets and eat for a longer period of time. 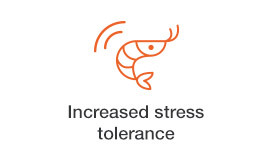 This leads to enhanced growth also during more stressful times for the shrimp. Most omega-3s in krill are bound together in phospholipids. Phospholipids are important to build flexible cells, allowing them to tolerate stress better. Phospholipids ensure that sufficient energy is stored and fats can be mobilized for transport to tissues, particularly important to overcome stressful environmental changes such as low oxygen concentration, molting, rapidly changing water temperature or salinity. A beneficial component in krill is the strong and natural antioxidant astaxanthin. In addition krill has beneficial omega-3 phospholipids. 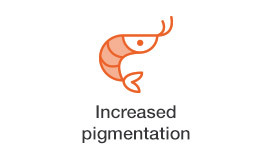 When shrimp feed contains krill, it has an optimal fatty acid balance of omega-3 to omega-6 fatty acids, which is important for reducing inflammation in shrimp. A strong immune system is the basis for good health, enhanced disease resistance and boosted survival rates. 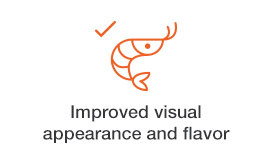 End consumers prefer a healthy looking and pink colored shrimp. In order to receive this, astaxanthin needs to be included in the diet. Krill contains high levels of natural astaxanthin that helps pigmentation. Consumer studies have shown that shrimps fed with krill are preferred over other shrimps. Also a higher percentage of EPA and DHA in the shrimp promote significantly higher tail fatty acid profile. Consumer preference has been found when compared color and flavor attributes to fish oil fed shrimp. Krill enables similar or improved performance at lower cost through replacement of other costly ingredients such as fish meal, fish oil, phospholipids and cholesterol. By reducing the amount of fish meal and other costly ingredients, with no effect on shrimp survival rates or final body weight, krill meal’s proven ability to improve feed efficiency can be very beneficial for aquaculture. The Antarctic krill fishery is one of the world’s most sustainable fisheries. Aker BioMarine is specifically known for near-zero by-catch, fully transparent operations and Marine Stewardship Council (MSC) certification, the highest sustainability standard for fisheries worldwide. Furthermore, the krill fishery received an ‘A’ rating from the Sustainable Fisheries Partnership as the only reduction fishery in the world that is in ‘very good’ condition. Benefits of Including Krill Meal in Shrimp Diets from Word Aquaculture Magazine whre Dr. Lena Burri and Dr. Alberto Nunes explains about the benefits of including krill meal in shrimp diets.